Tai Chi is the 'gentle' martial art for the relaxation of mind and body. Soft and gentle exercise for posture, balance and general well being. Tai Chi Chuan Yang Style is a soft and gentle form of exercise suitable for all ages. The initial attraction of Tai Chi practice may lie in the beauty and grace of its movements. It can also be continued into quite an advanced age without danger. Tai Chi has many health benefits because through the use of slow and soft movement the body is relaxed and free from stress. Click here for more information about Tai Chi, what it is and why it could be good for you. 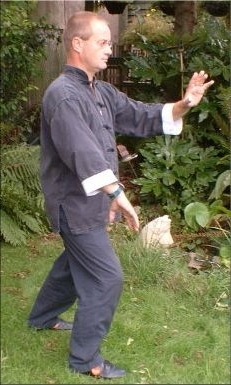 Tony Jones offers classes in Tai Chi - Yang Style Short Hand Form suitable for both beginners and experts, and also extra lessons and workshops for Chen Style Fan Form (as taught by Masters Eva and Karel Koskuba), Sword Form and Stick Form. Classes normally run during the Oxfordshire schools' term-time in Abingdon, Faringdon, and Wantage. You are welcome to join at anytime during a term. Click here for more information about the Classes. All classes in Tai Chi start with an element of warm-up exercises (Chi Kung) and the advanced classes may include some push hands practice (Tui Shou & Da Lu). Click here for more information about these Classical Exercises. 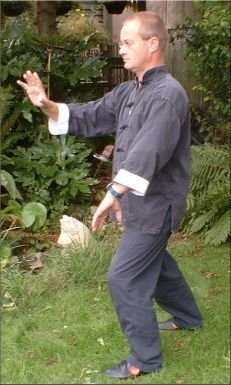 Tony Jones is a member of the Chinese Internal Arts Association and the British Council for Chinese Martial Arts. He learnt judo in his youth and progressed through various external martial arts including Kung Fu and Karate before discovering his true vocation with Tai Chi. Click here for more information about Tony Jones. A chance to learn the yang zheng zhang, stick gi gong. A fun but challenging exercise routine. Cost of workshop £20. If you require a stick please let me know asap. If you wish to get your own stick - buy a broom handle, make sure it’s straight, and cut it to 120cm. Sand and varnish. See our page for more details of the form. A chance to learn the first single fan form taught to me by Chen Master Eva Koskuba. A fun way to keep fit. I have 8 fans for sale and spaces will be limited. So please book asap. You can order fans from Tai Chi Link, silk and bamboo dragon fans. Cost of workshops with fan £30, or £20 if you bring your own fan. See our webpage for more details of the form.